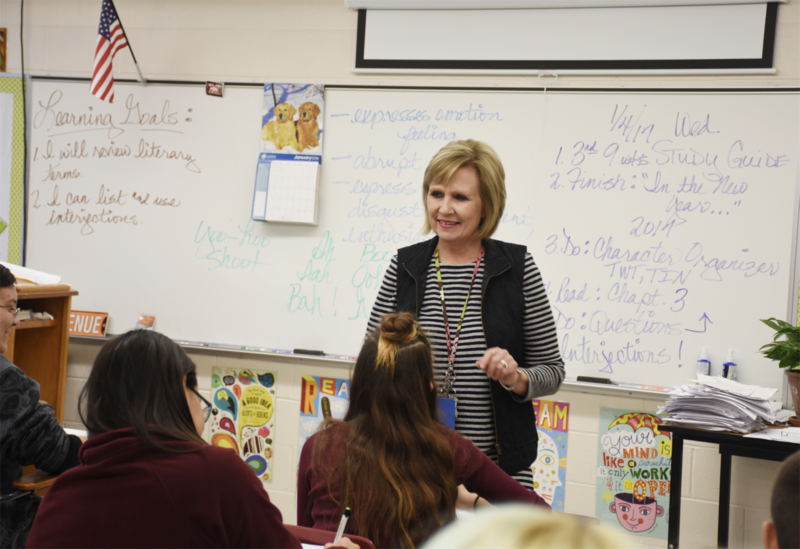 Mustang North Middle School Teacher of the Year Marilyn Bilbrey keeps things that matter to her. Her own experience in seventh and eighth grade was difficult. She mentally catalogued the smiles and kind words from her teachers, but she has kept the papers with thoughtful comments in the margins all these years. As a teacher, she’s no different. She has antique trunks, storage spaces and filing cabinets brimming with kids’ notes and special school projects. After high school, Bilbrey went to OSU, stopping just short of getting a teaching certificate. She married after high school and stayed home to raise her own children for 16 years. She was hired to teach at Mustang North and stayed for six years before moving to Duncan, then teaching at Deer Creek. Six years ago she came back to Mustang North. Middle schoolers are her favorite. Bilbrey’s favorite part of English to teach is grammar. Bilbrey has hands-on grammar projects like “Nouns in a Box.” When the time comes for prepositional phrases, they illustrate them. For Bilbrey’s last assignment of the year, she has her students write a letter to her. They can say anything about the class. She uses the notes to gain a better understanding of what helped and what should be revamped. She keeps the letters, every one. She said being named Teacher of the Year for Mustang North Middle School was an honor.